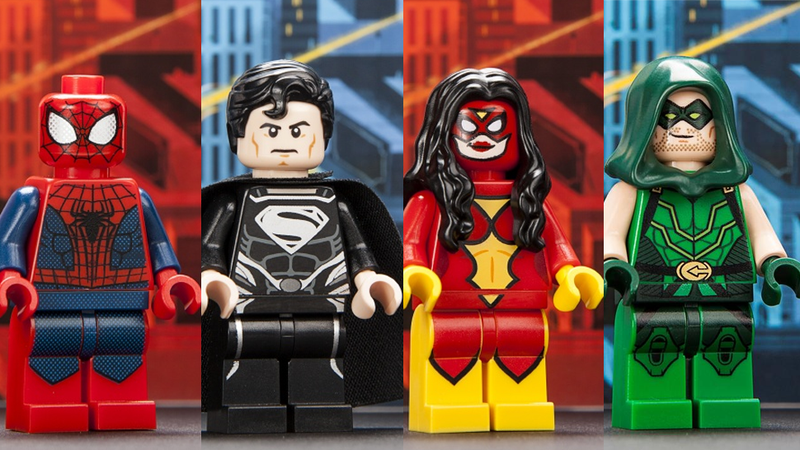 Miniaturised Green Arrow, Spider-Woman, Black suited Man of Steel Superman and Spidey in his Amazing Spider-Man 2 outfit will be handed out from Lego's booth next week. Revealed by USA Today... well, today, these four exclusive minifigures will be handed out at Lego's booth over the course of Comic Con next week. Spider-Man and Superman are variants of their previously released minifigures (although a TASM2 Spider-man could hint at the possibility of movie-based lego sets - Megablocks had the rights for the first movie's construction toys), whereas Green Arrow and Spider-Woman are making their début at the show. There's no word on just how they'll be doled out yet, but the past few years of Lego exclusives at the show have been rather hectic, so be prepared for frustration and long queues if you want to bag yourself one of these minifigure heroes. Or wait and pay out the nose when they inevitably show up on eBay, because of course they will.